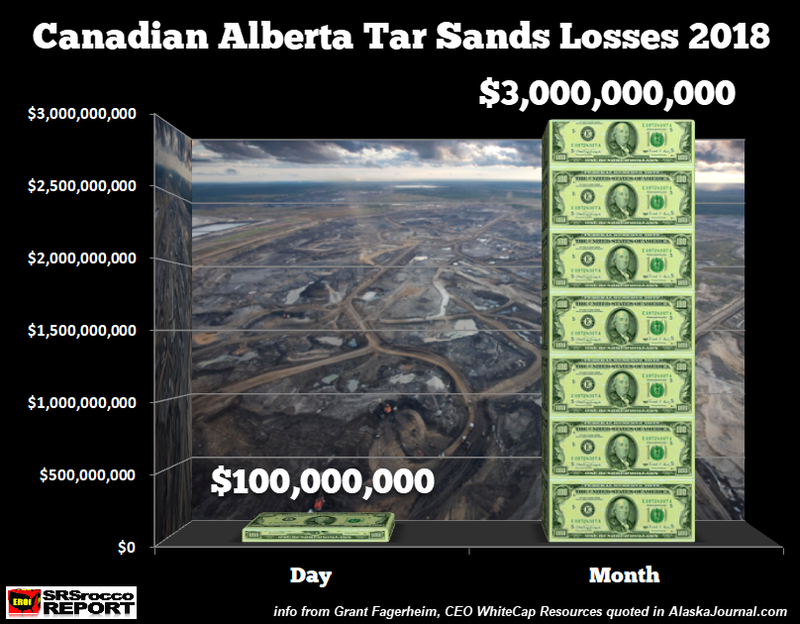 The situation at Canada’s Alberta Tar Sands Operations has gone from bad to worse as the super-low oil price is now costing the industry billions of dollars each month. Unbelievably, the price for the Western Canadian Select heavy oil fell to a gut-wrenching $14.65 yesterday down from a high of $58 in May. Tar sands oil is now selling at an amazing $40 discount to U.S. West Texas Oil which is trading at $56. The main reasons for the falling price of Alberta tar sands are due to Canadian pipelines full to capacity as well as midwest U.S. refineries shut down for seasonal maintenance. Furthermore, the announcement by a U.S. Federal Judge to block the construction of the Keystone XL Pipeline on November 9th, didn’t help. According to data from the Natural Resources Canada, the Alberta Tar Sands Operations were producing 2.7 million barrels per day (mbd) of oil in 2017. I would imagine production this year is likely to reach close to 3 mbd. The largest tar sands producer in Alberta is Suncor. Suncor produced a record 476,000 barrels per day of tar sands in the third quarter of 2018. Now, Suncor reported a handsome $1.4 billion profit in Q3 2018 on $8.3 billion in revenues. However, that profit was based on much higher Western Canadian Select (WCS) oil price which was trading over an average of $35 for the quarter. Unfortunately, the average price of WCS so far in the fourth quarter is $20.75. And, if the price of WCS stays at the current low price, the tar sands operators will be receiving less than $20 a barrel. “Heavy-oil producers are getting 40 percent of what they normally would be paid if we had access to markets,” said Grant Fagerheim, CEO of Calgary-based Whitecap Resources, which produces about 60,000 barrels per day. He estimates the price differential costs Canadian producers up to $100 million per day in lost revenue at current levels. …. “We are basically giving this stuff away,” analyst Martin King of GMP FirstEnergy told a Calgary Herald columnist. While this is probably a high estimate, it still shows how vulnerable the Alberta Tar Sands Operations are to extremely volatile oil prices. Furthermore, even though companies like Suncor are enjoying decent profits and free cash flow compared to the U.S. Shale Oil Industry, they make those profits based on a readily available supply of cheap natural gas. 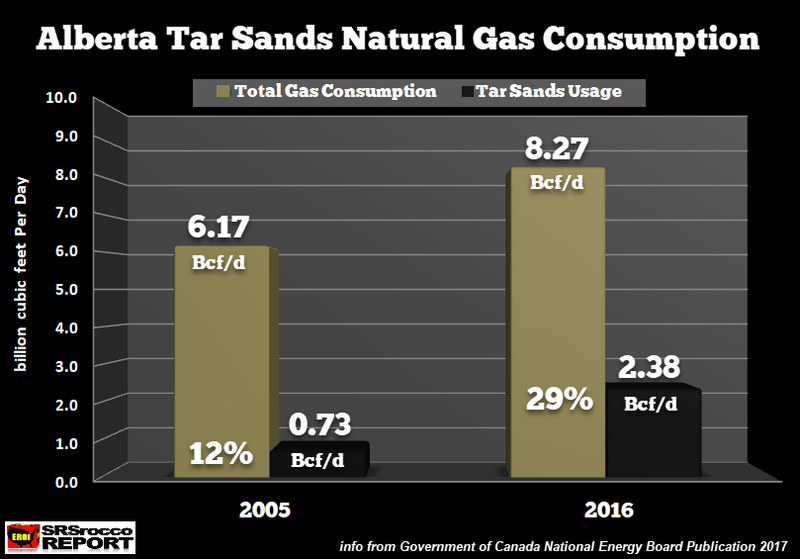 Now, if we go back to 2005, the tar sands operations only consumed 12% of the 6.17 billion cubic feet per day (Bcf/d) of Canadian natural gas usage. Thus, the increased use of natural gas to power and process Alberta tar sands operations has accounted for 78% of the overall growth of Canada’s natural gas consumption in the past decade. Interestingly, the price of Canadian natural gas that the tar sands industry has to pay has fallen considerably over the past several years. In 2014 the price of Canadian natural gas was $3.86 mcf versus $1.55 mcf in 2016 and $1.60 mcf in 2017. However, after natural gas prices hit a low the past month, they have spiked up to $2.50 mcf as of November 15th. So, with lower oil prices received for tar sands and higher natural gas prices paid to produce the tar sands, the fourth quarter could be a real bummer for the companies in Alberta if oil prices don’t recover. Reaching 5 Mb/d will get increasingly (energy) expensive, because there’s only enough natural gas to mine 29% of tar sands (and limited water as well). Using the energy of the tar sand bitumen itself would greatly reduce the amount that could be produced and dramatically increase the cost and energy to mine it. Since there isn’t enough natural gas, many hope that nuclear reactors will replace natural gas. That would take a lot of time. Kjell Aleklett estimates it would take at least 7 years before a candu nuclear reactor could be built, and the Canadian Parliament estimates it would take 20 nuclear reactors to replace natural gas as a fuel source. Mined oil sands have been estimated to have an energy returned on invested of EROI of 5.5–6 for mined tar sands (perhaps 10% of the 170 billion barrels), with in situ processing much lower at 3.5–4 (Brandt 2013). Right now, 90% of the reserves being developed are via higher-EROI mining, yet 80% of remaining oil sands reserves are in situ, so the remaining reserves will be much less profitable. I believe the biggest problem with the sustainability of tar sands if we ignore the nasty environmental issues, is the low EROI – Energy Returned On Invested. As point (4) states, a minimum of 7-14 EROI is needed to maintain civilization. However, I believe the realistic range of a minimum EROI to sustain our modern societies is likely 10-12 EROI. So, shale oil at an EROI of 5/1 or less (probably much less) and tar sands at 4-6/1, these are not sustainable energy sources. On the subject of labeling what they are doing in Alberta as “TAR SANDS or OIL SANDS,” I like to use the former even though some readers will try to correct me by saying that the industry uses “OIL SANDS.” I could give a rats azz what the industry prefers to use. If you have the opportunity to go up there in Alberta to check out that extremely nasty operation of processing subpar low-quality oil, I would imagine you would see it as a horrible TAR SANDS OPERATION. The industry likes to use “oil sands” because it sounds CLEANER. I will be writing more articles and updates on the Canadian Tar Sands Operations over the next several months. 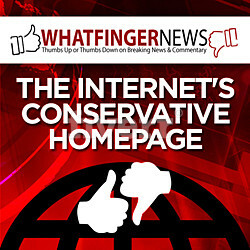 There have been some issues with the comment section, popular posts widget and email feed to subscribers. My webmaster has fixed all the issues with the website and is currently working on the email feed to subscribers which did not send out my last article dated November 14th. However, we should have that fixed shortly. Again, I appreciate the patience by my followers and paying subscribers for the lack of articles over the past month. However, there is a lot to write about as the situation in the economy, markets, and energy industry continues to disintegrate. So, I look forward to releasing more content and videos. Those who are following my work are seeing information that most have NO CLUE. When the economy and markets start to fall apart due to a lack of high-quality energy to run the system, most will not understand the reason. I am glad that many of you GET IT.